EIGSI La Rochelle is heir to one of the four private Parisian Engineering Grandes Ecoles from the start of the 20th century: the Ecole d’Electricité et de Mécanique Industrielle (EEMI – école Violet) founded in Paris in 1901. EIGSI is accredited to award the title of Graduate Engineer by the CTI for the maximum period of five years. In 2012, EIGSI signed a partnership with CFA-EIA and opened an apprenticeship engineering training section accredited by the CTI in May 2012. The school has also obtained the EUR-ACE and EESPIG labels (Quality labels in Higher Education). The school’s missions is three fold : training, research and innovation, reinforcing therefore the excellence of engineer training. Research and innovation have several beneficial effects: they guarantee the standard of knowledge transmitted to students by the research professors who find themselves up against the very best international standards in their discipline. Also, they offer students excellent training grounds. Learning about the process of innovation is a key element in our training programme. Creativity and innovation are taught in various forms (module on introduction to research methods, Innovation & Entrepreneurship projects in the 4th and 5th years). By participating in research activities, trainee engineers develop their taste for research as well as their ability to be bold and act on innovation. EIGSI La Rochelle is a school which offers a 5-year course in general engineering. 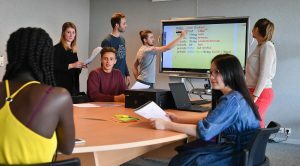 The training programme aims to reconcile learning about engineering techniques with knowledge of the industrial world in order to enable graduates to adapt to changes in their professional environment. The school currently has 830 students, 65 permanent staff members and 300 occasional contributors from the world of education and business. EIGSI La Rochelle provides high added value general scientific and technical training, with a major dimension dedicated to training in human skills and international openness, good relations with companies and the support of research and innovation which fits into the academic basis to generate training which is always at the cutting-edge of the discipline. Balance and progressive learning are key factors in the academics at EIGSI. This general approach is completed by a high level of involvement in projects and industrial work placements, as well as through the choice of a major, a professional focus which leads students to better understand the specific aspects of a technical field. This phase in the course guides the student’s career and offers them knowledge of the professional world. The major represents 2/3 of lessons over the last two years of the course. The student outlines the career of his/her choice. The choice of major he/she makes is the result of a gradual reflexion. There are many events which lead the student to make his choice: academic results, “professional” conferences, business worlds approached during initial professional experiences, meetings with EIGSI graduates, etc. international openness and a spirit of innovation. EIGSI places great importance on work placements (a minimum of 44 weeks in 5 years). In parallel, one of EIGSI’s key focuses is “project culture“. In direct contact with companies’ real problems, students participate in more than a dozen projects. These are designed to apply their project management skills, cement their scientific and technical skills and develop new ones. These projects entail compliance with specifications, a budget and time constraints. Furthermore, the collaborative work required in project mode participates fully in the development of listening, observation and group leadership skills. Since 2012, in partnership with CFA-EIA, EIGSI has offered an apprenticeship general engineering training course which combines a major in “Information Systems and Supply Chain Management”. This course enables apprentices to define their professional project in the world of logistics chain and information system professions. The three-year course is based on a regular rhythm of school-business training. Open to holders of a scientific and technical 2-year post-baccalaureate qualification, this course welcomes 40 apprentices in EIGSI-3, the first year of the engineering cycle. Thanks to EIGSI’s network of partner companies, they are received by companies such as Aerazur, Airbus, Alstom, Eads-Sogerma, Esterline, Valeo, Innovia, Devoteam, Vuitton, etc. EIGSI bases its work on values which aim to place the success of students at the heart of its preoccupations in a framework open to the outside world and its diversity, whilst also maintaining its own identity as a general engineering school. These values form the basis of the school’s culture and of its general engineering training. Respect for each one and regular sharing of knowledge and experience. Showing respect and recognising the value of people. Acting accordingly, with professionalism, taking account of our professions’ codes of conduct. Commitment is conveyed through the attitude of people who, aware of being part of our organisation, place their talent and their thinking at the service of the academic mission. Showing openness to others means accepting their difference and their uniqueness. We act by welcoming new ideas without preconceptions and by searching for the best choices to make for our students, our staff and for the accomplishment of our mission. Implementing innovation at the centre of our activities means bringing to light and deploying creative ideas in order to guarantee the development of our school in line with economic and social development.